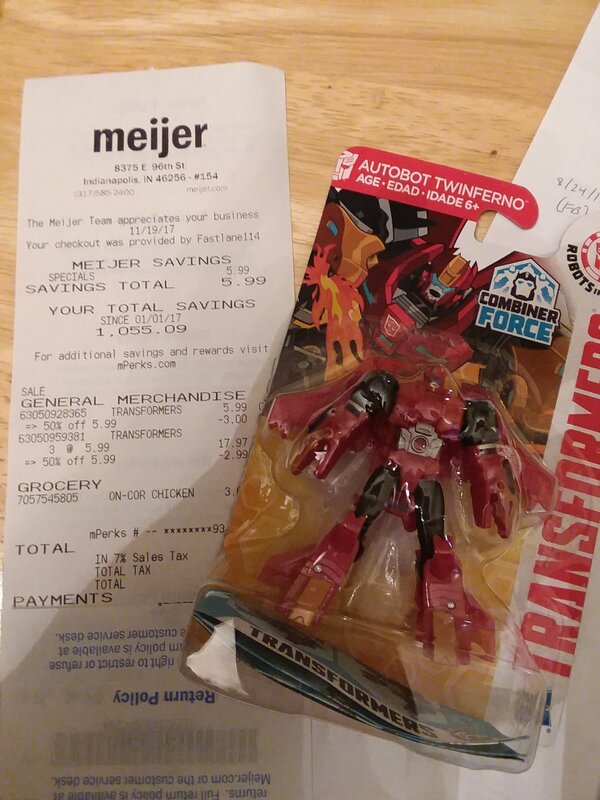 Thanks to 2005 Boards member undertaker for letting us know that Robots In Disguise Combiner Force Legion Twinferno was Found At US Retail. Legion Twinferno was found and bought at the 96th St. Meijer store in Indianapolis today. It’s time to check other Meijer stores to try to find this new Legion mold. Happy hunting for all RID fans! Let us know your sightings at the 2005 Boards! I saw this guy in mid-November at Stop & Shop supermarkets. Check their toy and clearance sections to find him. Some stores had him on the pegs, some in the clearance aisle. Saw one at the Meijer at 8000 E. Broad St in Reynoldsburg/Blacklick Ohio. Left it there, though. Anyone care to elaborate on why the toys were 50% off??? You should be posting that in the main deals thread!!!! I didn't even know this was a big deal. I bought mine last week. Also at Meijer. Well,so glad we have Legion Twinferno now. Twinferno ships in a case with re-releases of Sideswipe and Groundbuster. Unfortunately, this means the wave that contains Cyclonus and Heatseeker was skipped at US retail.